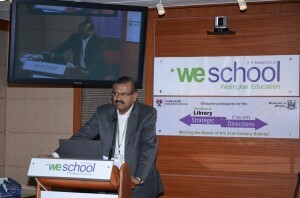 Weschool had the privilege of initiating and hosting ‘ Library Strategic Directions: Meeting the needs of 21st Century Scholar ’, a workshop jointly organized by University of Mumbai and Harvard Business School recently .The workshop was conducted by Ms. Melissa Shaffer, Director, Baker Library 3.0 Strategy and Infrastructure, HBS who spearheaded the strategic planning and infrastructure development to position Baker as a leading 21st century Knowledge & Learning Resource Center and the richness of her experience as the driving force behind the transformation was indeed awe-inspiring. 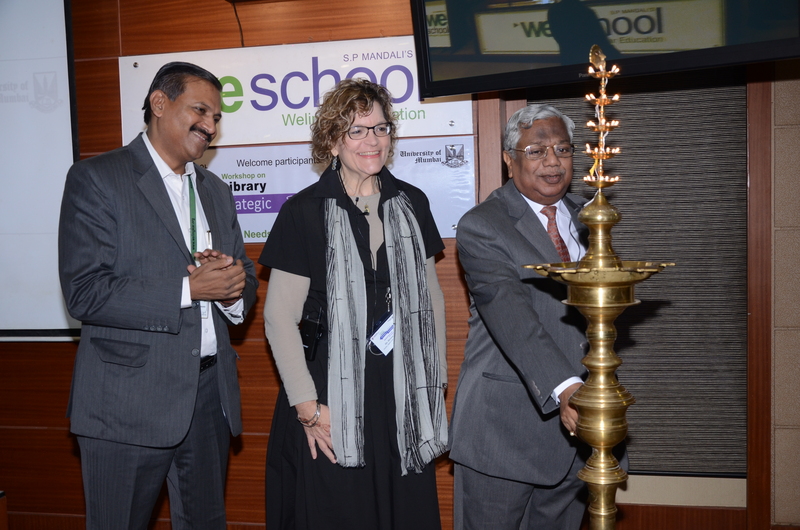 For the team of librarians from University of Mumbai and affiliated colleges of University of Mumbai that participated in the workshop at WeSchool, it was a leap into the future. With more than 600,000 volumes spanning seven centuries, databases, journals, cases, corporate reports and historical collections serving as a treasure of resources for the HBS community, as well as scholars across the globe, Baker is the largest business library in the world. 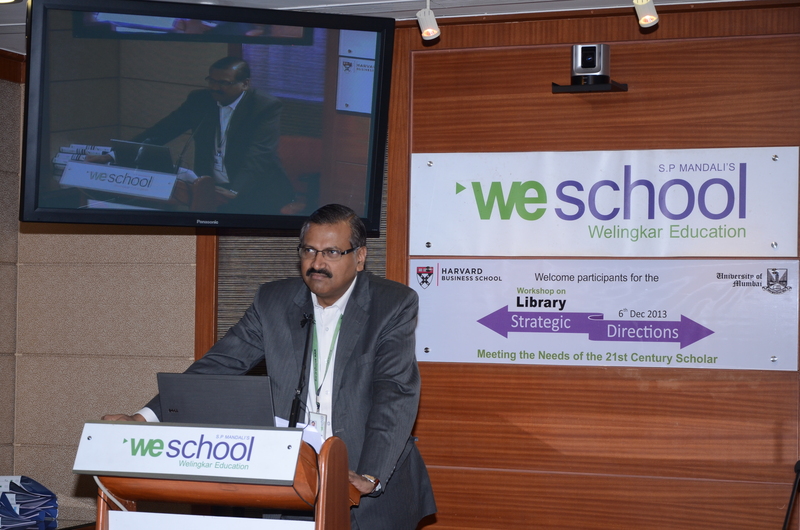 Dr Naresh Chandra, Pro-VC, University of Mumbai in his keynote address said”Library is the reflection of an organization’s vision. The eclectic collection of our library is housed in the iconic Rajabai Tower that is the symbol of University of Mumbai’s excellence in scholarly pursuits “.He urged the participating librarians to use the learnings from the workshop to create value for their respective organizations. 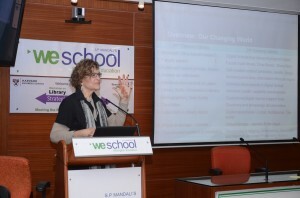 As Ms Shaffer took centre stage to outline the strategy of change that catapulted Baker library into the 21st century digitally connected thriving knowledge & Learning Resource Center, she explained ”Strategy means creation of a new position with a different set of activities or approaches that create unique value. A well defined communication strategy, execution that meets customer expectations, a culture of high performance and value and a structure that simplifies working in and with organization. So it is imperative to build strategy around clear value proposition “. She emphasised that there is chaos in every era but it is this phase of chaos that provides the opportunity to survey the world, think, look at customers’ needs and formulate a plan by making choices. 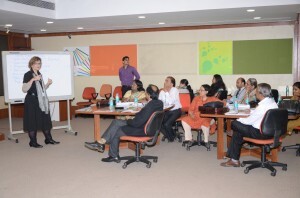 As she urged the librarians from University of Mumbai, it became clear that she meant business and business it was, as each librarian was made to do a GAP analysis, study the digital library trends ,examine the user expectations and devise the strategic shifts that were needed to step into the digital age. The participants were being coaxed to consider many of the factors and issues that seemed so distant till then , like the users’ demand for the’ information-right-now’, dependence of the teacher-student fraternity on social media ,increasing usage of multimedia in pedagogy, cloud computing, preservation of digital content and consortia based procurement of content.”The digital content needs to be curated and preserved as much as the print data and access must be provided for the benefit of future generations” said the enigmatic Ms Shaffer while driving the point home that this was indeed the moment to initiate change by charting new courses by taking some well informed decisions.”Be strong, be passionate, know where you want to go, exploit your potential for excellence by moving forward into the digital age” She urged. As the workshop progressed it outlined the tremendous contribution made by the Knowledge & Learning Resource Center to the five priorities outlined by Harvard Business School’s Dean Nitin Nohria when he took charge in 2010: curriculum innovation, intellectual ambition, internationalization, inclusion, and closer ties to the University establishing itself as a Thought Leader in the process. 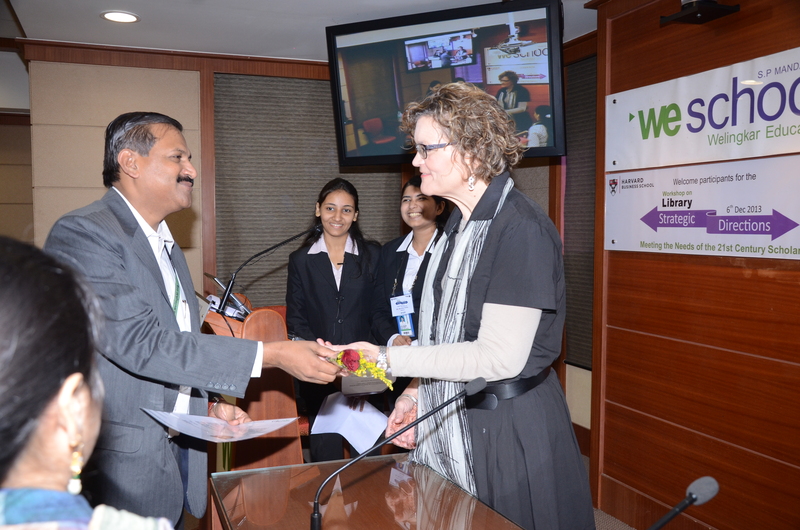 “Ms Melissa Shaffer’s workshop was interactive, involving and stimulating. Many feel that the digital age has brought in a new set of problems both for librarians and users. Ms Shaffer was quick to point out the many ways in which librarians could intervene and reinvent their understanding of the profession. We look forward to learning from many more such lively interactions and their implementation as we enter an era of global exchange” said Ms. Andrea Pinto, Assistant Librarian, University Of Mumbai. 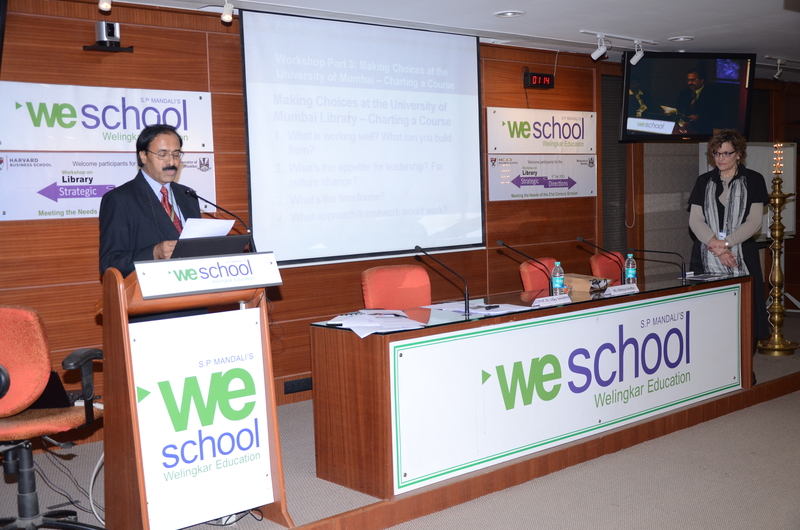 “WeSchool will keep the momentum high by organizing a series of action oriented meetings with the participants from the University of Mumbai and affiliated colleges to take the ideas, techniques and lessons learnt to achieve the objective of the workshop; to design the strategy to reach out and create the action plan to make the library’s role more meaningful to bring excellence to institutions” added Mr Giridhar Kunkur ,Librarian-WeSchool. 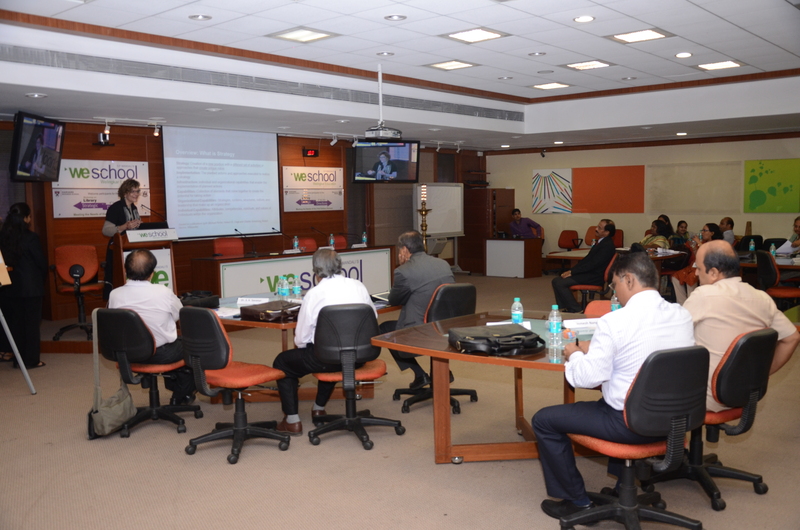 One such meeting was conducted soon after the workshop to look at how best one could take the deliberations forward by incubating some ideas learnt during the workshop in strategy setting process and improve work environments in the respective organizations. To create a Google Group – MUCLISforum ( Mumbai University and College Library Strategy Forum) to interact with each other to augment collaborative efforts. 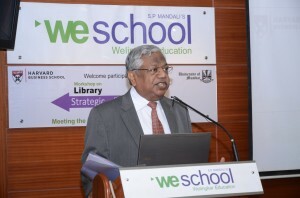 To encourage each library to develop its own webpage / portal to connect with its users / to promote services and put library resources to effective use. Neesha Vinchu, Librarian, Jai Hind College and Kiran Raikar Librarian of Birla College will work on the possible features of the library webpage ,to be shared with everyone in a time bound manner.